Here'll you find links to our 2020 Vision, policies, and information about our FAC Library. Figtree Anglican is a church with a rich and extraordinary history. Under God, the faithfulness of previous generations have brought us to this point in time; a people ready and willing to be used by God for His Kingdom. We believe in honouring the past and ensuring we provide a strong legacy for the future, as we strive to see the Kingdom grow at home and beyond. 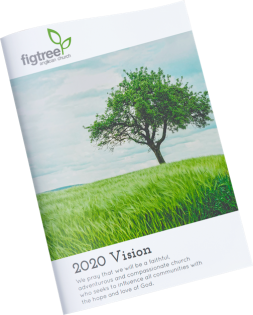 Much of what is shared in this 2020 Vision book is already underway, but it is our prayer that as we launch out once again with courage and faith, many people will hear and respond to the saving news of Jesus Christ. As a body of elders responsible for the governance of the Parish, Parish Council have an important role in the mission of our church. A significant part of this is ensuring that Figtree Anglican is effectively administered with policies and guidelines to support the ministry and the operations of the church. The Figtree Anglican Church Library exists for FAC members to have access to a collection of God-centred books for the building up of the body of Christ at FAC. The library is a great resource for LifeGroup leaders, Students and those wanting to expand their theological knowledge.